William Butler Yeats, (June 13, 1865 d. June 28, 1939) is known today as one of the greatest poets of the English language from the 20th century. He was born in Dublin and raised as an Anglo-Irish Protestant. Yeats's father attended Trinity College providing young William with an intellectual heritage. This aristocratic position, combined with his mother's emotional heritage, which encompassed rural culture in the trade of ship-builders, gave Yeats a different perspective from many of his contemporaries. where nobody gets old and bitter of tongue." Yeats also became increasingly attached to the country of Sligo. Interest in the occult led him to the Dublin Hermetic Society and to join (in 1887) the London Lodge of Theosophists. 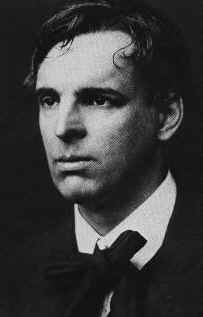 Yeats's encounter with John O'Leary caused him to envision Ireland as the primary literary subject of his poetry, as well as the commitment to the cause of Irish national identity, as expressed in "Easter 1916." In 1889, he fell in love with Maud Gonne and alluded to his love in the 1899 poem, "The Wind among the Reeds," through symbolic, stylized, and expressive verse. In 1986, he befriended Lady Isabella Augusta Gregory. She resided in Coole Park and Yeats's frequent visits to this mystical place gave rise to new topics and a model of "social grace." In 1900, he became the head of the Order of the Golden Dawn in London, and in 1902, he was appointed President of the Irish National Theatre Society later known as the Abbey Theatre. Yeats devoted great attention to the rebellion of 1916, as well as the independence of Ireland from England granted in 1922, and evolved as key themes throughout his poetry, characterizing the Middle Yeats period.